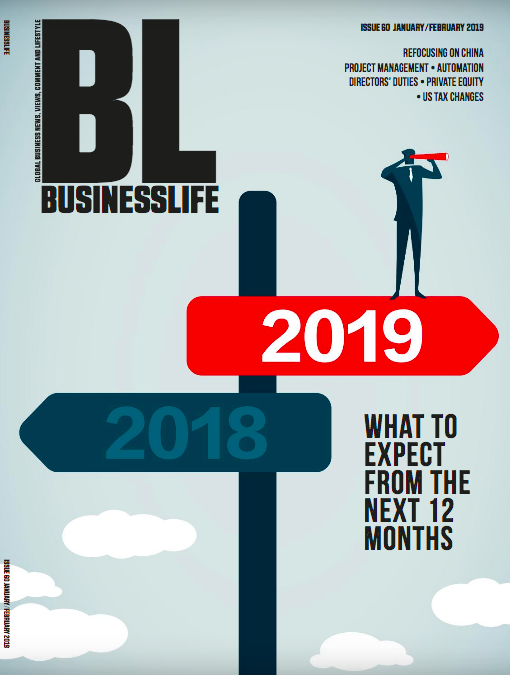 BL Magazine, January 2019. Original article p54-57. 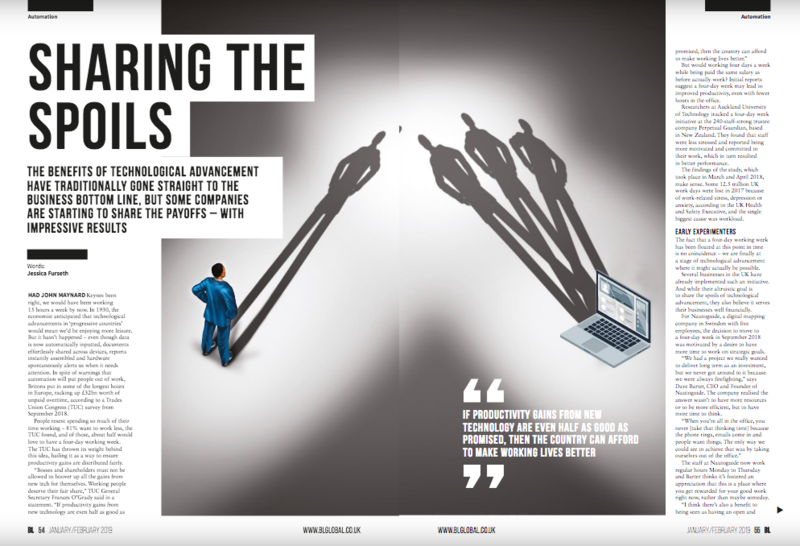 Automation leads to improved efficiency – but who benefits? Until now, the spoils of technological advancement has gone straight to the business bottom line, as staff keep working the same hours no matter how much time is “saved” by technology. We were supposed to be working 15 hours a week by now, predicted the economist John Maynard Keynes – in 1930 he anticipated that technological advancements in “progressive countries” would mean we’d be enjoying more leisure. But it hasn’t happen, even as data is now automatically input, documents effortlessly shared across devices, reports instantly assembled, and hardware spontaneously alerts us when it needs attention. In spite of warnings that automation will put people out work, Britons put in some of the longest hours in Europe – we rack up £32 billion worth of unpaid overtime, according to a Trades Union Congress (TUC) survey from September. But working four days per week – while being paid the same as before – would it actually work? Initial reports suggest a four-day week may lead to improved productivity, even with fewer hours in the office. When researchers at Auckland University of Technology tracked a four-day workweek initiative at a 240-people-strong trust and estates company, they found that staff were less stressed and reported more motivation and commitment to their work, which in turn resulted in better performance. This makes sense: 12.5 million UK work days were lost last year because of work-related stress, depression or anxiety, according to the Health and Safety Executive, and the single biggest cause was workload. The four-day workweek isn’t just some futuristic pipe dream. The fact that this idea has been floated at this point in time is no coincidence: we are finally at a point in technological advancement where it might actually be possible. 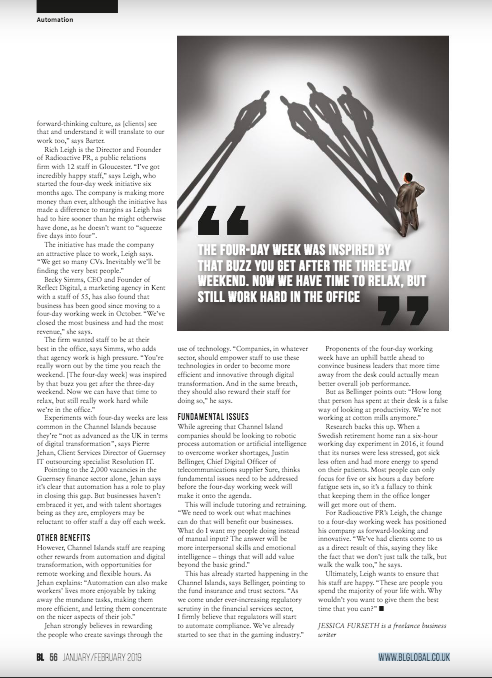 There are already several businesses in the UK who’ve implemented a four-day workweek. The companies BL spoke did have the altruistic goal of sharing the spoils of technological advancement, but they also genuinely believed it serves the business financially. The staff at NautoGuide now work regular hours Monday to Thursday, and Barter thinks it’s fostered an appreciation that this is a place where you get rewarded for your good work right now, rather than maybe someday. “I think there’s also a benefit to being seen as having an open and forward-thinking culture, as [clients] see that and understand it will translate to our work too,” says Barter. While these early day experimentations with the four-day workweek are promising, it is very early days – it is hard to say for sure just how this change will affect companies’ bottom line. But while people on the Channel Islands put in just as many long hours, corporations in finance, professional services, and tourism industries may be less inclined to opt for less time in the office as a means of passing on the benefits of automation, at least for now. The proponents of the four day workweek have an uphill battle ahead to convince business leaders that more time away from the desk could actually mean better overall job performance. “But how long that person has spent at their desk is a false way of looking at productivity. We’re not working at cotton mills anymore,” says Bellinger. Most people can only focus for five or six hours per day before fatigue sets in and quality starts to decline; when a Swedish retirement home ran a six-hour workday experiment in 2016, they found that nurses were less stressed, got sick less often, and had more energy to spend on quality interactions with their patients. It’s a fallacy to think that keeping people at work automatically means getting more out of them.” Research backs this up – most people can only focus for five or six hours per day before fatigue sets in, so it’s a fallacy to think that keeping people in the office automatically means getting more out of them. Posted on 01/10/2019 by Jess. This entry was posted in JF. Bookmark the permalink.